The first track ‘Nature Of Inviting’ is a beautiful way to start, harking back slightly to the sultry trip-hop of The Sneaker Pimps. Pulsating drums and thoughtful electronic elements dominate whilst Chris Corner’s lyrics are soft and seductive as always. A highlight is the unusually high notes which he uses within the chorus, this is spikey electro-rock at its best. 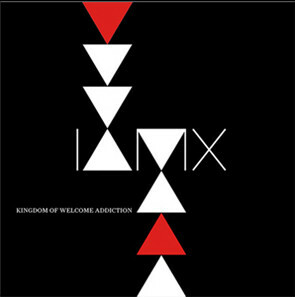 The title track ‘Kingdom Of Welcome Addiction’ is haunting at its opening, fine piano and defiant synths form the backbone for the first minutes. Here, Corner is breaking out of his shell, he shows a bravery and passion that will no doubt translate well to listeners. It’s furious and tender in equal measure. ‘Tear Garden’ by contrast balances a bouncy melody with dark lyrics, it’s a dark cabaret of sound. This track is about “kicking” the listener and reminding them that IAMX has grown up both sonically and mentally but that he will always stand for the alternative way of thinking and embrace those who feel as though they are outcasts within contemporary society. Next up, ‘My Secret Friend’ features Imogen Heap. Its pop-drenched tones wash through the ears creating a moody but infectious mood. It is part Depeche Mode and part Savage Garden. The song itself seems to be about a destructive relationship between two people that is both positive and negative at varying points. Of course, we have all experienced this and as usual Corner documents dark personal experiences well in an accessible way. ‘An I For An I’ has a rock hard mentality which is scratched heavily by sharp electronics. It’s one of the most hard-hitting tracks on the disk and it’s an un-relenting and scathing attack on humanity as it is today. ‘I Am Terrified’ sways back and forth. It sees Corner’s ego attacking itself. Here he has created an anthem for himself and managed to make it sound like the least selfish thing he’s ever composed, powerful, brutal and brilliantly done. This track is the standout on the record and it will no doubt identify with some readers who will enjoy this on repeat for hours. ‘Think Of England’ studies the composer’s love/hate relationship with his home country. As the lead single it remains true to IAMX’s alternative appeal whilst managing to be more “poppy” than most of his previous work. Drums standout here shoving the tune forward accompanied by charming piano work and soulful vocals that reflect just how the conflicting feelings about both Berlin and London still rage within the artist. Follow-up ‘The Stupid The Proud’ balances enchanting acoustic melody with vitriolic lyrics attacking organised religion and how much it affects on the world every day. ‘You Can Be Happy’ again will strike at your core, it instantly gives the listener hope, stating obviously “it’s a cruel world for small things” – never a truer phrase, but still this song provides us all with a sense of hope through grandiose string instrumentation and a rebellious upbeat attitude. Similarly, ‘The Great Shipwreck Of Life’ powers up with a militaristic beat and a sweet whisper geared to seduce and evoke. Soon this rock anthem explodes into the ear with vicious drums and cutting indie guitars. This one looks at the bittersweet elements of your everyday life. After all, every one of us has “the bad days and the good nights.” With this though, we can at least dance in the face of the adversity provided by the nine-to-five routine, the credit crunch and that pesky love thing we all have to deal with. Final track, ‘Running’ is a sombre completion to a cracking album. Stripped down and hymn like, this could have multiple meanings to different listeners and is very much open to interpretation, but it feels like this is only just the beginning of something even greater for an artist who whilst “running the race” on his own seamlessly manages to create music that communicates in some way to alternatives all over the globe. ‘Kingdom Of Welcome Addiction’ is the strongest album we have heard all year, and we can’t put it any other way. It’s great stuff. If you like rock, industrial, classical, alternative or electro music, you will find something to enjoy here.